As anyone with an ear to the shipping forecast will know, Finisterre was the name of the large, often unpredictable area of the Atlantic Ocean off the North West tip of Spain. It’s also the name of a hardy bunch from Cornwall dedicated to making clothes for what they like to call ‘cold water surfing’. This may sound like it’s ripped straight from the hallowed pages of Roger’s Profanisaurus, but it is in fact the simple act of surfing in cold water. What would inspire seemingly sane people to thrash around in icy cold waves at six in the morning? I paddled precariously over to Finisterre mouthpiece Ernie Capbert to find out. It's good man, things are buzzing in here. I started with a half-assed stretch. I don't really know what I'm doing, but I focus on the lower back — it's the thing we use the most, the thing we exercise the least and it's the first thing to go when you get old — take care of it. I got in the sea, it wasn't great, but I have to get in, it’s just something I have to do. Some people smoke, some people drive cars fast, I get in the sea. After the sea I go over to the workshop, get greeted by the dogs and say hello to everyone. It seems Finisterre is a fairly easy going place to work. Can you give us an example of an average work day at the workshop in Cornwall? There's never an average work day, skateboards, dogs, wetsuits, boards, meetings, talking to some very rad people and then spreading the idea of cold water surfing — it always comes back to that. I’ve never been surfing and, to be honest, I don’t know much about it. Am I right in saying there’s a lot of preparation involved? How do go about planning for a morning of surfing. Would you just turn up at the beach, or do you have to spend a fair few hours listening to the shipping forecast? There is in the start I guess, like anything, getting the gear to surf and the gear to live within a cold water surf environment — both are just as important as each other. If you're not rigged up properly, it's tough. Everything is dictated by the weather — the right winds, the right tide, the right swell direction. The playing field is constantly changing, no two waves are the same. It's not like a skatepark that you can just rock up to or a basketball court you can just play at — so many conditions have to come together to make the waves we ride. Like I said, if you find yourself in Norway, not properly rigged up and your tent isn't right, your cooking stoves are bogus, your sleeping bags aren't warm enough and jackets don't keep you warm and dry, things can go horribly wrong. So let’s say I’ve decided I want to go surfing on a beach on the Isle of Skye tomorrow. What do I need? To surf you need a hooded 6/5 wetsuit, boots, gloves, a couple of boards and some spare leashes. 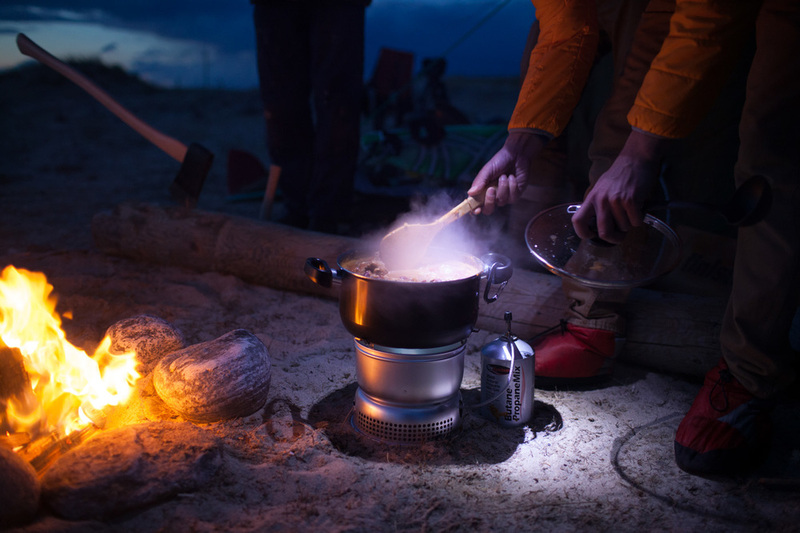 And to live you need a lightweight cooking stove, a knife, an axe, a sleeping bag, rigger boots, a head torch, waterproof matches, an OS map and a couple of enamel mugs. Everything should be in wraps, to make it easier to clean up afterwards, and easier to handle when your fingers are coming out the back of stage 2 hypothermia. Do people surf in the rain? I realise that you’re already going to be wet, but is there any weather that you wouldn’t surf in? We surf and have surfed in everything — it's really hard to turn away from world class waves. We have had ice in the line-up, snow on the beach, snow-capped mountains in the background and have still surfed. Why do we do it? Uncrowded waves and big spaces. There’s a good quote from Prince where he said, “I’ll always live in Minneapolis, it’s so cold it keeps the bad people out.” Does this apply to surfing too? I imagine you’ve got to be a certain type of person to want to get up at five in the morning and throw yourself at a wave. Haha, I love this. Deeper, colder and further off places do naturally sieve the crowds, and I'd also probably say that when you do see another surfer in a cold water surf spot, you know what they've done to get there and you have a greater respect for one another off the bat. Unlike warm water surfing, where there’s more crowds, more hassling for waves and a bogus vibe in the water. Now I don't mean this every time, but if I had to compare cold and warm on average, I'd say the vibe in the water is better when it’s cold. Did Prince surf? Surfing sometimes seems like an unattainable past-time because decades of surf-imagery tell you that you need clear blue water and the hot Californian sun to go surfing. With you lot saying otherwise, do you reckon there’ll be an influx of people taking up surfers around the British Isles? I guess you only have to look at all the industries before us — like climbing, snowboarding, and skiing. Brands build better products to allow people to pursue the things that jack them up and the better the products, the more people can access it and industries are born. So yes, maybe our development of these products will open up surfing to more people, as the products get even better. But the thing that excites us the most is all the waves yet to be ridden and the many more spots that these products will open up. I sometimes get a glimpse of what it must've felt like when Phil Knight started selling shoes out the back of his van at collegiate running events — we're at the very beginning of something very special — can you imagine it? You’re not afraid to name names and say who you think is doing surfing a disservice. Who do you think is doing good things for surfing at the moment? Surfers Against Sewage and Patagonia do great things for surfing, but I would say it's more the individuals within cold water surfing that are driving it forward the most. There are people right now going deeper and colder than anyone else, the stories and the images that they're coming back with are mind blowing. They're paving the way. Will you ever sell up and head out to Hawaii, or are you quite happy in the icy waters of the UK? Nelson Mandela once said that every man naturally gravitates to the place he was born. Warm waters I will visit, but it’s the cold ones I'm from. At the moment you’re working on a wet suit for the ‘cold water surfer’, how is this different from normal wet suits? This project is on hold at the moment. I feel we would be in danger of biting off more than we could chew. In order to make the products we're making, and at the same time promote the cold water surf category, it's a full time job. So right now, we're hanging the wetsuit up for the moment, we're not closing the door, we’re just letting it dry for the moment. Changing the subject a bit, what is a Bowmont sheep? We wanted to focus more on sourcing natural fibres from home. The wool industry was huge here in the UK, and it will be big once again. The Bowmont sheep is a cross between a Shetland and a Merino. The fibre is just as fine as merino wool, but it’s made in the UK. We've been growing the flock from 15 to over 150 in the last five years, and one day we'd like to think that this will be the only natural fibre we use in our products, but this is a long way away yet. Can you tell us a bit about the fancy new overshirt we've just got our hands on? We've made it reversible — so you've got one lining that looks clean and comfortable and if the weather begins to turn, you can reverse it and leave the DWR (durable water repellent finish) windproof rip-stop fabric and 60gram insulation to deal with it. We've also extended the back of the collar, so that when looking out to sea, you can protect the back of the neck — it is beautiful. It seems like you lot are always trekking off on adventures. Are there any more exciting voyages in the pipeline? A lot of work still needs to be done in Scotland, the Orkneys and the Outer Hebrides. Our next trip will be in the New Year and probably looking like it's going to be on a Scottish island. What do you lot do in the rare moments you’re not designing clothes, surfing or camping? The people in this place are nuts, our designer does all his own ink and our founder is a big sea swimmer, often swimming out further than the eye can see. We ride motorbikes, we go spearfishing, a lot goes on to the left and right of surfing. Any wise words you’d like to add? If you've got a few hundred grand, an eye for design and understand the needs of cold water surfers — you may want to think about starting a brand, as it's all to play for. Cheers Ernie. Now, where did I put my spare hundred grand?